Big Brother is Watching — Paolo M. Mottola Jr. Hold the phones. Actually, hang them up. The government is tracking your calls. 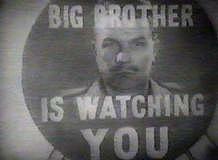 A USA Today article from Thursday revealed a secret government surveillance program of Orwellian proportions. According to the article, "The National Security Agency has been secretly collecting the phone call records of tens of millions of Americans, using data provided by AT&T, Verizon and BellSouth..." The NSA is using the data to analyze calling patterns in an effort to detect terrorist activity. The NSA, launched shortly after 9/11, was under fire earlier this year for eavesdropping on people, suspected of having links to terrorism, when they made international phone calls. W. authorized the NSA eavesdrops without warrants. The media condemned the program as illegal and the public interpreted it as an invasion of privacy. I guess we were just getting warmed up. Now, the phone carriers are under fire for disclosing what was presumed to be private information. Verizon (I just switched to T-Mobile. Hello again, Catherine Zeta-Jones.) was handed its first class-action lawsuit yesterday to the tune of $5 billion. According to the AP story, the "lawsuit that claims the phone carrier violated privacy laws for giving phone records to the National Security Agency for a secret surveillance program," and "asks the court to stop Verizon from turning over any more records to the NSA without a warrant or consent of the subscriber." Just down south, an Oregonian today filed a $1 billion federal lawsuit against Verizon Northwest, claiming the company violated his privacy rights. While I think this invasion of privacy is ridiculous, and I should be standing up against the program in principle, if the NSA wants to listen to my calls to Scott, I'll tolerate it. I have nothing to hide. We're very entertaining. I will have a problem if T-Mobile starts charging me for 3-way calling. The NSA's going to have to pick up that bill. "Now, for liberals who've long been going against almost all of these issues to defend privacy, the news has to be disturbing. But no less so the conservatives who have fought national ID cards and gun registration for years out of fear of big government. Now, whatever you consider yourself, friends, you should be afraid. You should be very afraid. With over 200 million Americans targeted, this domestic spying program is so widespread, it is so random, it is so far removed from focusing on al Qaeda suspects that the president was talking about today, that it's hard to imagine any intelligence program in U.S. history being so susceptible to abuse..."